If you are going to do any serious woodworking you will need a good wood turning lathe in your shop. The ability to turn wood is every bit as important as sawing or planing planks and drilling holes. If you don’t have access to a decent wood lathe the types of products you can produce are significantly reduced. But, if you’ve started the search for a lathe you probably found that the number of lathes on the market is daunting. There are so many brands of lathe available and so many different features on each model that finding the best wood lathe for your money is tough to sort out. We understand your frustration, which is why we put together a handy Wood Lathe Comparison Chart to help you cut through all the noise. Below is a handy table letting you compare and contrast what we feel are the best 5 benchtop wood lathes on the market. When it comes to picking out a benchtop lathe for your shop, there are a few critical features to evaluate as you make a decision. Here are some of the top things to consider before making a choice. Price – You can find a low-cost wood lathe for as little as $200, and high-end lathes (like this Powermatic 1352001) cost several thousand dollars. But as with most things – with wood lathes you get what you pay for. An inexpensive lathe won’t hurt your wallet, but it will be short on features and significantly limit the types of projects you can turn. 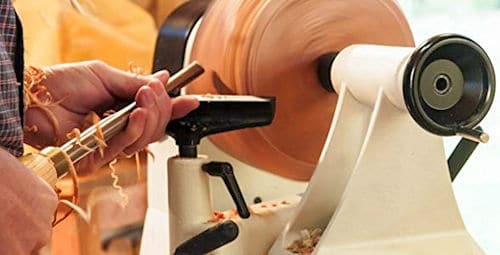 If you are just getting started turning wood you may get by with an entry-level lathe, but don’t expect it to meet all your needs or last for an extended time. If you are making a living from woodworking – or at least some decent side income – then it is probably worth investing in better tools. Brand – Often (but not always) brand names matter. Better brands get the reputation of being a better brand because they put out better quality products and have better support systems in case something goes wrong. Picking up a no-name generic wood lathe from China may be cheaper, but as the tools get more expensive it is nice to know there is a quality company backing up your tools. Size – We all wish our wood shop was huge, but that isn’t the reality for most woodworkers. In a perfect world you could have a dedicated lathe area in your shop, with dedicated cabinet and wall space for all your different chucks, blades, and bits. But if like most people space is at a premium, a benchtop lathe may be a much better choice. Being both lighter and more portable, benchtop wood lathes can be brought out when a project calls for turning, and then stored when other tools need the space. Either way, be sure to check overall the overall footprint of any wood lathe you are considering, to ensure you have enough room for it to operate and for you to work it safely. Projects – The type of projects you typically work on significantly impacts the kind of wood lathe you should pick. The first thing to consider is the max thickness of the wood you intend to turn. That answer will determine the swing over bed and the swing over tool rest base you need to consider. After that take note of the max length of wood you intend to turn. That number will tell you the range you need for distance between centers on your wood lathe, and will let you know if you need to think about adding an extension to your lathe. Speed – One of the wood turning rules of thumb is that if you multiply the lathe’s RPM by the thickness of the wood stock you should end up with a number somewhere in the range between 6000 to 9000. As an example – if you want to turn four inch stock, the speed must lie between 1500 RPM and 2250 RPM (4×1500=6000 and 4×2250=9000). But that rule of thumb is affected by the type of cut you plan to do. For rough cuts you would likely run the lathe slower than 1500 RPM, and for fine cuts you may turn it faster than 2250 RPM. But overall, if you know the size of the wood stock you intend to turn, you can calculate the RPM range you want from your wood lathe. More complicated projects may require more features from your lathe. You may have to do a little additional research to find all the info you need, but thankfully most manufacturers publish their spec sheets and user manuals online.